With its large cast, sprawling dramaturgy and taxing solo parts, Verdi's La forza del destino is not a common visitor to the UK operatic stage. The opera was chosen as the first of three Verdi operas Welsh National Opera is co-producing with Theater Magdeburg. 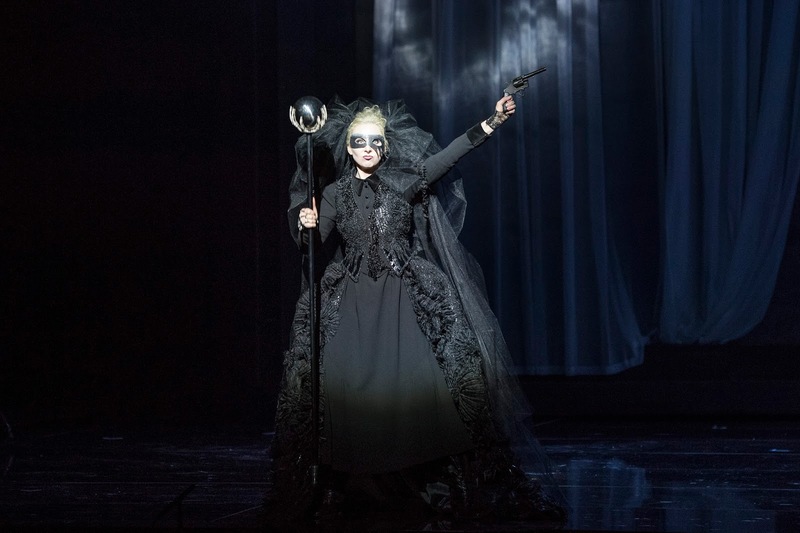 La forza del destino opened at the Wales Millennium Centre, Cardiff, on 2 February and we caught the performance on 10 February 2018. Directed David Pountney with set designs by Raimund Bauer, costumes by Marie-Jeanne Lecca, lighting by Fabrice Kebour and choreography by Michael Spenceley, Mary Elizabeth Williams was Donna Leonora, Gwyn Hughes Jones was Don Alvaro, Luis Cansino was Don Carlo di Vargas, Miklos Sebestyen was il Marchese di Calatrava and Padre Guardiano, Justina Gringyte was Preziosilla and Curra, Donald Maxwell was Fra Melitone, Wyn Pencarreg was the Alcalde, Alun Rhys-Jenkins was Mastro Trabuco and Julian Boyce the surgeon. La forza del destino was written for St Petersburg in 1862. As the excellent programme book explained, the opera was due in 1861 but was postponed due to the illness of the soprano, and Verdi would revise it for the 1869 performances at La Scala, but in fact each of these dates saw the opera in a different state as Verdi and Piave struggled somewhat with the subject and the structure. [ Verdi's 1862 version is available on disc from Opera Rara].Following La traviata in 1853, Verdi's operas began to change. Having written Les vepres Siciliennes for Paris in 1855 Verdi seems to have become interested in larger scale historical subjects, the operas of this period often lack the tight focus of the middle period operas. For La forza del destino Verdi saw Preziosilla and Fra Melitone as important characters, and the diverse almost Shakespearean nature of the plot was something deliberate. 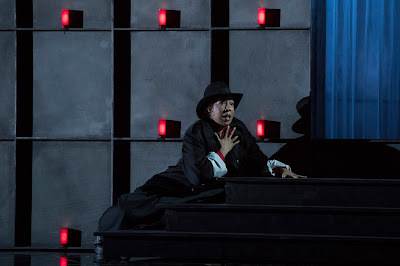 No version of La forza del destino is perfect, that is part of its fascination as we watch composer and librettist trying to create a new type of operatic drama. 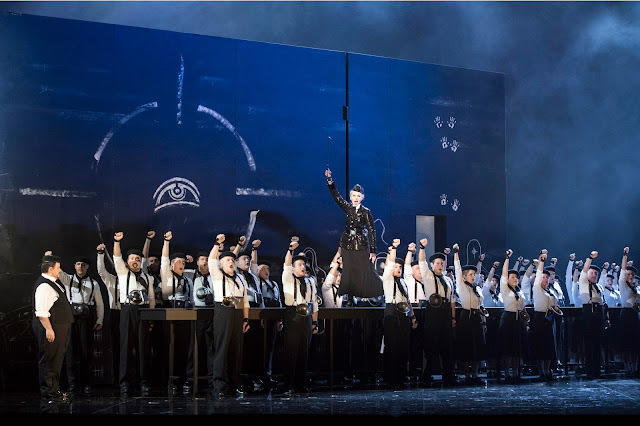 WNO's new production was an impressive achievement, and whatever details of David Pountney's production might annoy or puzzle, there is no doubting the overall focus and remarkable urgency of the resulting drama. Parts of Act Three did sag, but that is almost inevitable, but overall Pountney and conductor Carlo Rizzi very successfully transformed this somewhat sprawling work into something powerful and urgent. The production was abstract, a series of movable screens creating the right atmospheric spaces with visible war damage in Act Three, though the constant moment of the set by stage hands could be distracting. Costumes moved between periods, the subject was war at any period. David Pountney's main innovation was to double roles, Justina Gringyte played Preziosilla and Cura, Miklos Sebestyen played the Marchese and Padre Guardiano, and in each case virtue was made of necessity. Padre Guardiano was deliberately like the Marchese in looks, as Pountney evoked the sense of Leonora searching for a father replacement. Preziosilla and Curra were merged into a fate figure so that Justina Gringyte stalked the stage controlling events. An interesting idea, but costuming Justina Gringyte like the bad fairy Carabosse seemed unhelpful and I wondered how many people understood her role. There was no comedy, Donald Maxwell's Fra Melitone was just as fierce as everyone else. And the chorus was treated as a block, no naturalistic struggling ordinary people here. In Act Two they were a scary Nazi-youth-like student band, the monks were all bloody bishops and in Act Three masks made everyone caricatures of themselves. The message was quite clear, in this tragedy all were culpable. 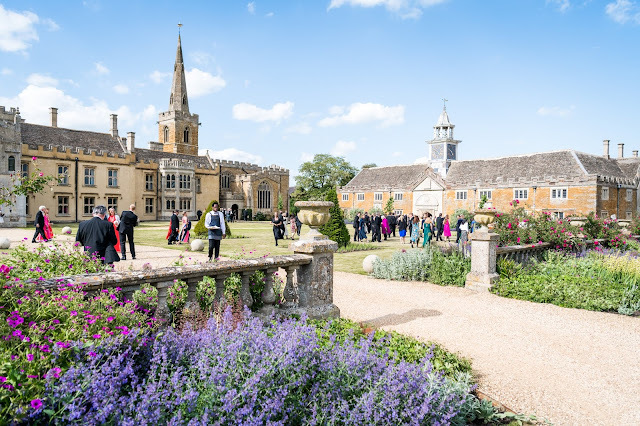 The result threw focus onto the principals and Pountney drew some remarkable performances from his cast, it was these intimate scenes which really lifted the drama. Mary Elizabeth Williams brought out Leonora's neurotic obsessive behaviour. She was nervy in Act One and grew positively manic as the opera progressed. It was a powerful performance which made sense of the character rather than leaving it to fate. Williams has a lovely fluid voice, plenty of gorgeous line in Verdi's challenging vocal writing. At the moment the voice does not ideally open up at the top in the climactic moments but she gave us some quiet, intense singing and spun a lovely line. Gwyn Hughes Jones created a powerful figure in Don Alvaro, his voice is quite narrow in focus which brought a fine combination of power and flexibility. 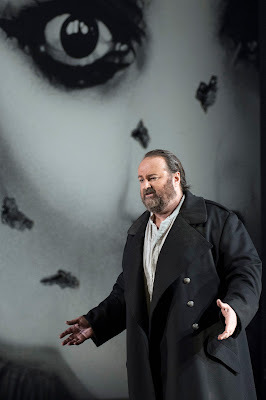 This was a notable performance, with Hughes Jones revisiting a role he sang in 2015 with English National Opera [see Ruth's review]. Gwyn Hughes Jones is not the most flexible of stage actors, but he made this a virtue, bringing out Don Alvaro's powerful immovability yet his voice giving us a strong sense of this character's journey. 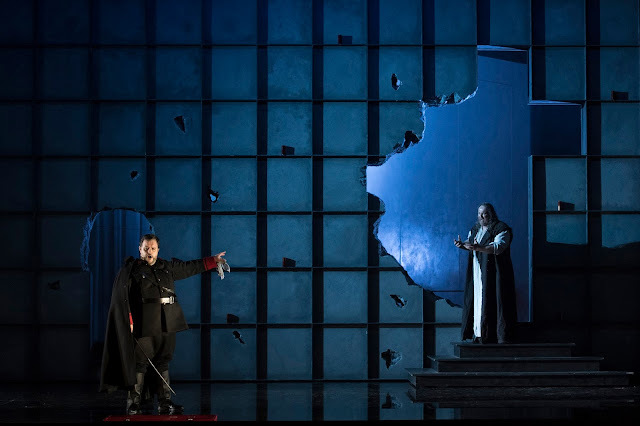 I cannot imagine Don Carlo more beautifully sung than by Luis Cansino, he brought an ideal sense of Verdian line to the role and the scenes with Gwyn Hughes Jones' Don Alvaro were some of the finest late Verdi singing I have heard in a long time. So it might seem churlish to complain but Cansino never quite convinced us of the sheer obsessive intensity of Don Carlo's hatred. Perhaps the beauty of tone and rather down to earth stage presence were a bit too much. Miklos Sebestyen was a wonderfully stiff, inflexible Marchese and a finely sympathetic Padrew Guardiano. 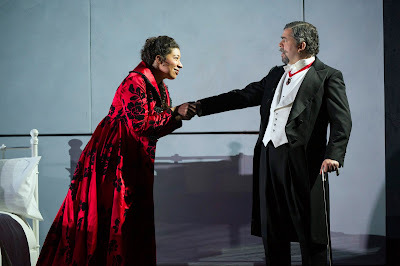 His scene with Mary Elizabeth Williams' Leonora in Act Three was beautifully subtle in the way the two characters interacted, making sense of a tricky moment. Justina Gringyte brought great panache to her double role. She sang both here Act Two solo and the Act Three 'Rataplan' with finely vibrant tone, and knitted these two into a coherent whole as the production's eminence grise. Donald Maxwell was a strongly characterised Melitone, far nastier than usual whilst Wyn Pencarreg and Alun Rhys-Jenkins were strong casting as the Alcalde and Mastro Trabuco. 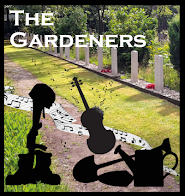 The chorus sang magnificently and there was plenty of opportunity for them in this opera. David Pountney's concept of the chorus was very active, and the WNO chorus threw itself into the production with a will. For my taste, too many of the large scle scenes relied on tropes familiar from David Pountney's productions in the past (I saw my first Pountney production in Scotland in the late 1970s) but others in the audience seemed respond. I felt the lack of the Shakespearean breadth in this account of the opera, but instead Pountney had achieved the remarkable feat of making this sprawling flawed masterpiece seemed focused and urgent. In the pit Carlo Rizzi and the WNO Orchestra followed suit. The overture was both subtle and thrilling, and the orchestral playing really drew us in and added to the grand dramatic sweep of the score.